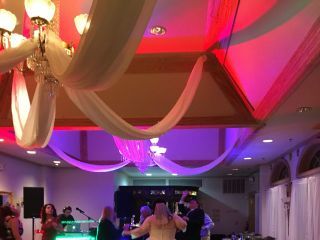 We had a wonderful time at our wedding thanks to the amazing music provided by Top Shelf Entertainment. Ethan did a wonderful job of reading the crowd and what we needed. Thank you so much! Cannot say enough about Jordon. He is very responsive, polite, personable and experienced. It was breeze working with him and everyone was extremely happy with the music choices. Highly recommend. We had our wedding on March 9th, 2019 and i have to say it has been a DISASTER with the communication with the venue and whatnot so my confidence for the big day was at an all time low. I met with Jordon two weeks before the wedding to get the logistics with the music and whatnot handled and he reassured me that he was gonna make the big day memorable regardless of what was going on with the planner and everything. With that being said, Jordon EXCEEDED at being an amazing DJ, he even went as far as basically planning out the reception timeline (which wasnt even his job but he did it because he knew how much we were stressing). It would be an understatement to say that he was more than exceptional. I personally feel like if it weren’t for him our wedding would’ve been a disaster. He kept the guests on their feet and kept the party alive from the moment the ceremony started all the way to the sparkles at the end of the reception. I couldn’t thank Jordon enough for his professionalism and for his willingness to go the extra mile for my wedding. I can honesty recommend him for any occasion and fully endorse his work ethic. Thank you Jordon for setting and exceeding the standards and for making the best day of my life the most memorable. His motto is strictly facts and you would be getting NOTHING less than top shelf if you book him. Jordon was our dj and day of coordinator. He was super easy to work with. I made changes to our reception timeline and music selections various of times all the way up to our introduction into the reception. He is quick to respond and worked with us when we had to reschedule our wedding due to the hurricane. He was able to incorporate the perfect mix of music for our guest and interacted as well for different dances. He was great and all of our guests loved him just as much as my husband and I did!! This was a destination wedding for us, being about 4 hours away he made our wedding run perfectly and our nerves at ease. He went above and beyond our expectations! It was all perfect! Jordon was absolutely amazing throughout the entire wedding process. He was patient and never rushed us to make sure we had exactly the right songs for each part of the day. And then on the day of he was perfectly on cue during the ceremony, and during the reception read the crowd to a tee. He made our day absolute perfection and a ton of fun too. 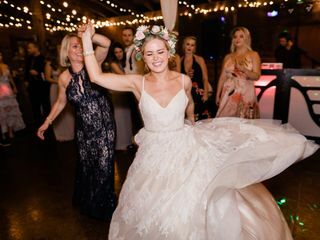 We were in such a whirlwind that I barely had time to notice, but our guests made it a point to say how amazing and fun Jordan was - during and after the wedding. He got up and danced with our guests. The dance floor was never empty. One of the easiest decisions you can make for your wedding day. Jordon was amazing from day one. Very professional, patient, and was on time for meetings leading up to the wedding and for the big day. He helped a lot with his opinion for song selections when we were unsure. 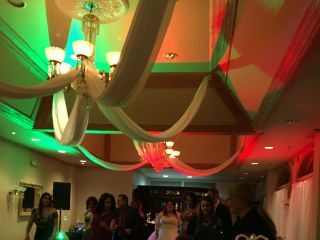 Although a lot of our guest was older family that didn’t dance I throughly enjoyed myself. The entertainment he provided for the wedding was amazing! Thank you Jordon we will be definitely recommending you to other! Jordon did a great job! We loved him as the DJ for our wedding! Thanks for the best day ever! Jordon at Top shelf entertainment was absolutely incredible. Our music was flawless the entire day. He was very professional and was always prepared for every moment we had at the ceremony and reception. If you’re reading this wondering if you should book Top Shelf Entertainment or not, just do it! Thank you Jordon for being such a big part of Our day, it was PERFECT! Jordon is awesome!!!!!! I've had the pleasure of working with Jordon on many events! He just brings a whole new level of class and energy to the dance floor. It's magical! Not only is he a great DJ, but he's organized and knowledgeable about the wedding industry. 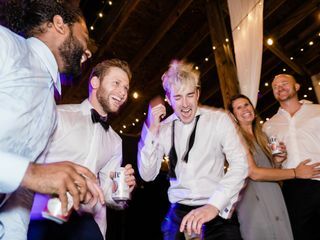 If you want your wedding to be a night filled with dancing, Jordon is your guy. He will keep you and your guests engaged and entertained all night! Thank you Jordon for ALL of the great experiences you have given me and my clients! Jordan is hands down the best DJ I have ever met. He went above and beyond to make my wedding perfect. I would recommend him to absolutely ANYONE! 20/10! My husband and I just loved Jordan! 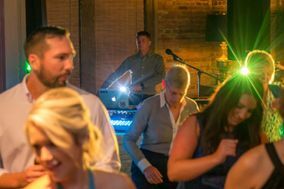 He is an amazing DJ and helped to coordinate all the music and events of our big day (musicians for the ceremony, timeline of first dance, cake cutting, etc). He was very professional and a pleasure to work with. Also extremely knowledgeable about what works best with weddings and the venue you chose. I can't speak highly enough of Jordan! He was exactly what we wanted in a DJ for our wedding. With very little direction, he was able to pull off THE most perfect wedding playlist. He had the accurate versions of all songs to be played during the ceremony, which is the only thing I was anxious about. The best part was that he had every single person dancing and having an incredible time during the reception. He was not intrusive and read the crowd so well, even teaching some of his impressive dance moves. Jordan did a great job at my wedding, we were very pleased! There are no words to describe how fantastic Jordon was at our wedding. He was extremely professional and prompt when answering questions. 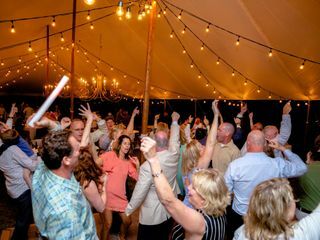 Almost every guest at my wedding commented on what a great job the DJ did. He really made the wedding a success and got up and danced with the crowd several times. I would more than highly recommend Top Shelf Entertainment. Jordon did a fantastic job. He worked with us from the very beginning and helped us to pick the exact music we wanted. He had a very organized system which made it really simple for us to pick out the music we wanted or help him know what kind of mood we wanted the music to convey during a certain time of the night. He was also really good at being the MC and staying on schedule with our wedding coordinator so that nothing was missed. We had an entertainer come and he even went as far as to buy the type of equipment that she needed so that she could perform. He made sure our night was amazing and memorable and I’d highly recommend him to anyone who asks. Jordan was the perfect DJ for our wedding. He’s a young guy, but knows weddings in-and-out! He perfectly queued the music at our ceremony and reception. He played our must-haves and a really cool mix of seventies, eighties, nineteen and current hits. He spent time with us before the wedding to really understand our style and what we wanted. He even gave us a few ideas that we incorporated into our special day. People really danced a lot at the reception, including my mom who really dug all the tunes. At one point, towards the end of the night, Jordan joined us on the dance floor for a song. That boy has some moves! Jordan was exceptional, we couldn’t have asked for a better DJ and Director for our wedding day. It was flawless from the ceremony to the reception. His ability to respond quickly and take away as much stress from us as he did was something we appreciated so much. Our pastor also loved his direct direction to make things efficient and easy on everyone who was apart of our wedding. I couldn’t recommend him more. Jordon, was amazing! He was both our DJ and Day of Coordinator and our wedding went so smoothly! it poured on our wedding day and we had to change our ceremony location a half an hour before our wedding and he and venue facilitated the location switch flawlessly (decorations, people, technology, etc). Also, the music kept everyone dancing and entertained all night! we received so many compliments on how fun our wedding was. Thanks again Jordon for all of your hard work! Jordon was wonderful! He was so much fun to work with and always gave quick replies! He is an awesome DJ and I would recommend him to anyone! Top Shelf Entertainment goes above and beyond to make you as a client happy! If we could give Jordon more than 5 stars, we would! He was amazing. 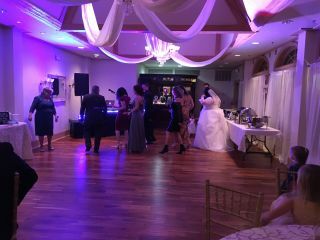 All of our guest raved about what an awesome DJ we had. He even got out there and danced with us!! Highly recommended!! Jordan went above and beyond to make my day special. Was very easy to work with and very responsive to my messages and questions. Made everything go smoothly and even joined us on the dance floor. Just want to say thanks for everything and look forward to seeing and working with you again. I got married one month ago on May 20 in Savannah, GA. Jordon was AMAZING!! 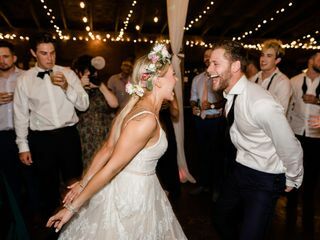 I have zero dance moves, and was really nervous about the first dance with my husband in front of everyone. Jordon spent hours showing us dance moves so that I would feel comfortable out on the dance floor on my wedding day. Jordon was attentive, he listened and remembered songs I did (and did NOT) want played, and was the picture of professionalism and FUN! He got the crowd on their feet and dancing, and I got so many compliments from my guests on his DJing and Emceeing my reception. He really set the tone for my reception, and quickly became one of my favorite vendors - I definitely recommend him!